The electric guitar has been used worldwide for more than half a century. The “guitar heroes” of the past and present have done anything from plugging into literally thousands of effect pedals to using a variety of objects to hit the strings to modify the sounds of their guitars. The Misa guitar attempts to continue this tradition of ingenuity into the next century by being a completely digital guitar. The Misa guitar is actually an advanced type of MIDI controller that is powered by a 500MHz AMD Geode CPU and runs Linux under the hood (but don't worry; you don’t need Linux to use the guitar). The Linux firmware code is open source, which allows programmers to modify it to their liking. While MIDI controllers and guitar-emulating synthesizers are nothing new to the music world, the Misa guitar is not your average key/knob/fader MIDI controller. The first thing that stands out about the Misa guitar is that the traditional pickup setup that you’d expect to find in the center of the guitar is replaced by an 8.4-inch 800-by-600-pixel resolution LCD touchpad. This is somewhat similar to a guitar that MUSE lead vocalist and guitarist Matthew Bellamy uses, except that on the Misa you strike the pad to hit the notes instead of strings. The touchpad is set up on an x/y coordinate pair where you will assign your desired effects. Accordingly, striking or dragging your fingers in different areas around the touchpad will produce different modulations of the effects, which rids you of the need to move knobs or faders to change the intensity of an effect. The touchpad is also pressure-sensitive, so the harder you strike it, the louder the notes will ring, just like a real guitar. On the neck of the guitar you will find 144 “keycap” sensors instead of strings. There are 6 sensors across 24 “frets” on the neck, replicating a traditional 6-string guitar setup. The maker of the Misa guitar says that the keycaps were not made pressure-sensitive because it would make the instrument harder to play, which may be well-received by those of us guitarists who struggle with hand strength and those dreaded barre chords. The Misa guitar will be available in either black or white. Although a price has not been set for it just yet, the maker expects to release that information within the next few days. 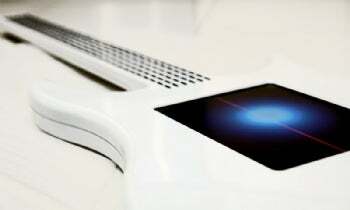 This story, "Misa Digital Guitar Makes Your Rock Band Peripherals Feel Inadequate" was originally published by PCWorld.